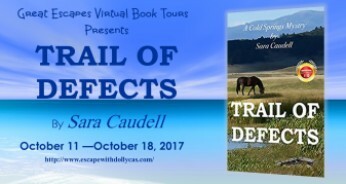 This week, find out more about the book TRAIL OF DEFECTS by Sara Caudell in an interview with its author. DISCLAIMER: This content has been provided to SHANNON MUIR’S INFINITE HOUSE OF BOOKS by Great Escapes Virtual Book Tours. No compensation was received. This information required by the Federal Trade Commission. I have always had to write, mostly business letters and regulatory statements. 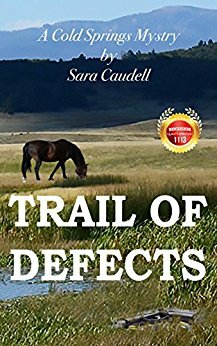 I write mysteries, but with a modern western theme with little or no romance. I read about 100 books a year- mostly mysteries- and they got boring. There was no real creativity. I thought I could do better. 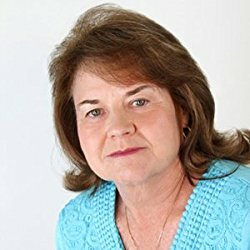 I decided I was too lazy to get a publisher so I decided to self-publish and see if anyone was interested in my stories. I hope they enjoy the story, and feel it was not a waste of time. I also have a little moral comment in there somewhere, without it being preachy. Readers who say positive things about the story and the fact they enjoyed it. Since I write mysteries, the challenge is to not have an ending that people are going to guess half way through the book. Being around other writers is important but not taking their suggestions too serious. Biggest down fall is to let them end up writing your story. Stick to your guns. If your writer group doesn’t like your story ideas, find another group. Keep the story your story. I like mysteries, thrillers, an occasional romance, good and accurate historical novels and bios. I foster kittens and injured cats for the local animal shelter. I have only had one “foster failure” that I had to keep, a Manx with intestinal problems. 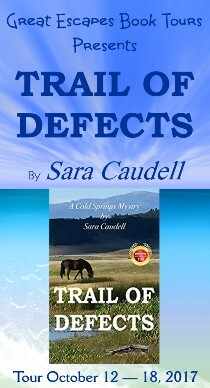 Visit Saracaudell.com, my website for the Cold Springs mysteries. You can learn more about the town and the people. Thank you very much, Shannon for including me in your blog. I’m a big fan of yours.